Nestled between East Village and National City, Barrio Logan has transformed from a scruffy warehouse district to a hotbed of art, cuisine, and Chicano culture. 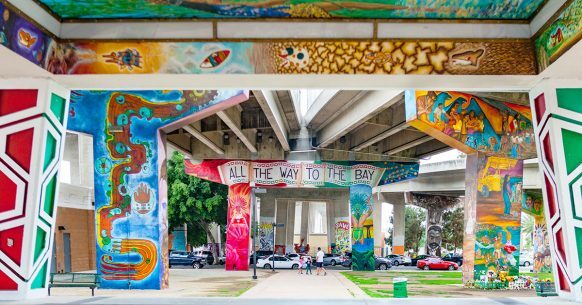 It would be impossible to truly know San Diego without taking in the murals of the area’s cultural crown jewel, Chicano Park. And there’s plenty of other well-worthwhile things to eat, drink, and see while you’re there. It is one thing to know that this 7.4-acre park is a National Landmark and a powerful symbol of Mexican-American history, claimed by the community who protected it from becoming a California Highway Patrol station. It is another to behold the stories of civil rights and immigration told on its mural-covered walls. Don’t miss Chicano Park Day, celebrated each year in April. Here you’ll find everything you love about Mexican street food in a hip location sporting tattoo-inspired wall art and pinstriped car hoods. There’s a reason the Travel Channel has taken notice of Salud! : These folks know their carne guisado, birria, al pastor, and other Mexican faves. Stay for the churros and vanilla ice cream. Café Moto’s beans are delicious enough to be found all over this coffee-obsessed town. Luckily, they have a brick and mortar in Barrio Logan where you can fuel up before checking out the neighborhood—or refueling after a fun tour. In the age of Instagrammable, million-dollar establishments, Las Cuatro Milpas contrasts that with a bare bones place with plain tables and vinyl tablecloths. Yet the out-the-door line demonstrates what people like so much about this authentic Mexican food joint, like their handmade tortillas. The first brewery in the area is still one of the most notable. Indulge in no-frill Mexican street tacos while quaffing craft beers with a lot of personality. The Horchata Golden Stout evokes the sweetened rice milk favorite while the Cafe Ingles is loaded with three different kinds of chocolate malt and French Roast coffee. Wish you had an epic crash pad to kick off your shoes after exploring Barrio Logan? This hotel consists of just a single rental: A stylish $90-per-night studio outfitted with Netflix, a backyard bocce set, and Insurgente beer. Established in 2013, this 9,000-square-foot studio and gallery in a former warehouse has become one of the city’s most vital art hubs. Its walls host established and up-and-coming artists, while the annual Día De Los Muertos Skull Art Show has rightfully earned its place as a yearly must-see. This entry was posted in Attractions and tagged downtown, entertainment by San Diego Magazine. Bookmark the permalink.